The logical course of action after every new attempt to make a neat gadget is to pack the unique qualities of two different devices and merge them into a single one. 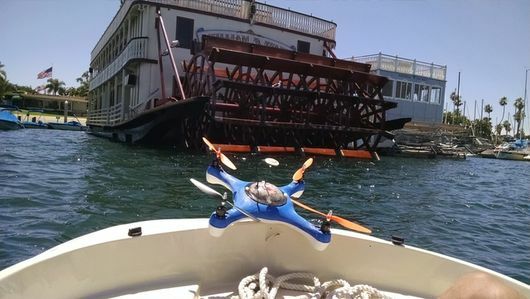 After witnessing a waterproof quadcopter and an autonomous fishing unit, what would be the next product in the market? Yes! An autonomous fishing drone indeed. The Aquadrone was the brainchild of Daniel Marion, and he designed it be used with interchangeable pods mounted at the bottom. Just like normal fishing, the robot has to locate a concentration of fish before moving in for the lure. A SONAR based fish scouting pod is first attached to the bottom of the Aquadrone, and it is then used to do some reconnaissance around the place. The radar can detect fish till 120 feet, and it feeds live data from the findings via wi-fi to the user’s smartphone. When the user locates a school of fish large enough to carry a raid, the user presses a return home button, and the drone flies back automatically. It is a nifty feature of the drone as it eliminates the need to monitor it after each interval. When it returns, we replace the SONAR pod with a Line Flier Pod and attach a trap or a lure at the end of the line. The drone then flies away to the same spot. Bad luck if the fish are gone because you will have to do all the steps once again. Once the drone is in place, it will release the line and the trap will go to the same height where the fish were last seen. Now it is up to the fish to nibble on the trap and get caught; which they do, in large numbers! A waterproof HD submersible camera has also been planned with the AquaDrone. Currently, it is looking for crowdfunding at Kickstarter. An initial pledge of 999 $ will see you become the owner of this drone. It is quite expensive for a monthly fishing trip, but professional fishers might benefit a lot from it. It removes a large portion of the human decision making and lets portable science to do the job. It can be expanded to include autonomous fishing net system too.